Multiple studies demonstrate a strong independent association between CKD and cardiovascular events including death, heart failure, and myocardial infarction. This review focuses on recent clinical studies that expand this spectrum of adverse cardiovascular events to include ventricular arrhythmias and sudden cardiac death. In addition, experimental models suggest structural remodeling of the heart and electrophysiologic changes in this population. These processes may explain the increased arrhythmic risk in kidney disease and aid in identifying patients who are at higher risk for sudden cardiac death. Finally, we review here the data to support the use of pharmacologic and device-based therapies for both the primary and secondary prevention of sudden cardiac death. CKD affects approximately 13% of adults in the United States.1–3 Its incidence continues to rise as the population ages, and obesity, hypertension, and diabetes increase in prevalence. The elevated risk of cardiovascular morbidity and mortality in this population is well established and often precedes progression to ESRD and dialysis.4–7 Historically, the cardiovascular death associated with CKD had been attributed to the complications of atherosclerotic disease.8 A substantial proportion of cardiac deaths, however, is not directly linked to myocardial infarction (MI), stroke, or heart failure suggesting the presence of other processes contributing to cardiovascular mortality.9–11 Recently, kidney dysfunction has been evaluated as an independent risk factor for sudden cardiac death (SCD), which has been adjudicated as a distinct endpoint in various cohort studies and clinical trials. This review highlights the epidemiology of kidney disease and SCD, potential mechanisms for this association, and management strategies to reduce the burden of this fatal event. Coronary heart disease (CHD) or congestive heart failure (CHF) markedly increases the risk of SCD in the population.22,23 Both left ventricular dysfunction and New York Heart Association functional class are important risk factors for SCD and have been incorporated as diagnostic and clinical parameters that guide the placement of implantable cardioverter-defibrillators (ICDs) for the primary prevention of SCD.24 The majority of patients who suffer a cardiac arrest, however, will not have had a left ventricular ejection fraction (LVEF) <35% documented before SCD and thus would not have qualified for an ICD.13,25,26 In order to address effectively this public health dilemma, intermediate or other vulnerable subgroups of the population need to be identified so that preventive and management strategies can be evaluated. In addition, an understanding of the mechanisms underlying SCD in well defined subgroups may help to provide additional insight into this condition across the entire population. Initial studies demonstrating an increased risk of SCD among patients with kidney disease stem from subgroup analyses of clinical trials designed to evaluate the efficacy of ICDs. The Multicenter Automatic Defibrillator Implantation Trial-II (MADIT-II), which evaluated the benefit of prophylactic ICD therapy in patients with a previous MI and a LVEF of ≤35%,27 investigated the risk of SCD among patients with CKD. 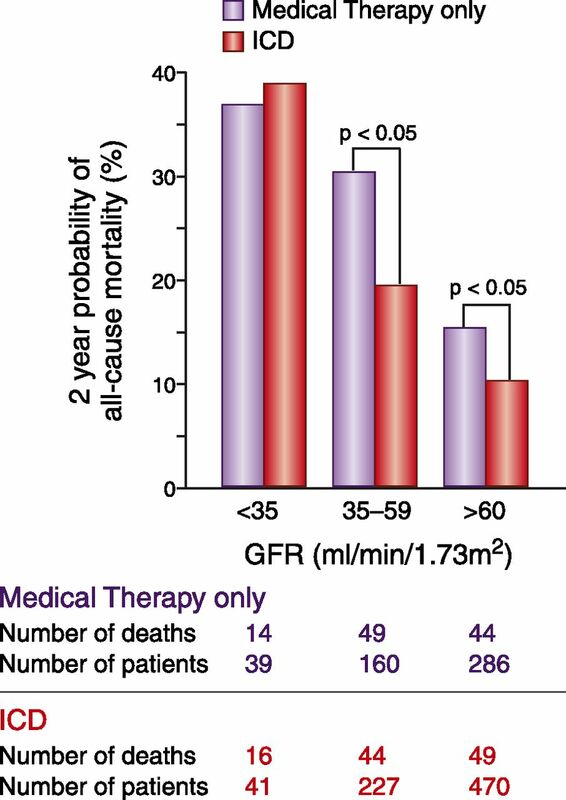 Among participants treated with optimal medical therapy only, the risk for SCD was 17% higher for every 10 ml/min per 1.73 m2 decrement in the estimated GFR (eGFR).28 Similarly, in the Comparison of Medical Therapy, Pacing, and Defibrillation in Heart Failure trial,29 which demonstrated the benefit of cardiac resynchronization therapy in reducing death or hospitalization in patients with advanced heart failure and conduction disease, kidney dysfunction was associated with a 67% greater risk of SCD during the 16-month follow-up period.30 Similar studies in more intermediate risk populations with CHD and without heart failure also demonstrate an independent association between kidney dysfunction and SCD (Table 1).31,32 Despite these findings, the presence of heart failure, systolic dysfunction, and/or coronary disease that were required for entry into these studies precluded an understanding of whether kidney dysfunction was a marker of severity of cardiac disease or an independent risk factor for SCD. Population-based studies have attempted to understand the risk of SCD among participants with kidney disease by minimizing the confounding effects of prevalent cardiovascular disease. Among 4465 community-based participants from the Cardiovascular Health Study without a history of heart failure or MI, the incidence of SCD was >2.5-fold higher with lower levels of kidney function (Figure 1).33 Further analysis from this study also utilized both creatinine and cystatin C measures to identify a subgroup with preclinical kidney disease defined as a creatinine-based eGFR ≥60 ml/min per 1.73 m2 and cystatin C ≥1.0 mg/L. 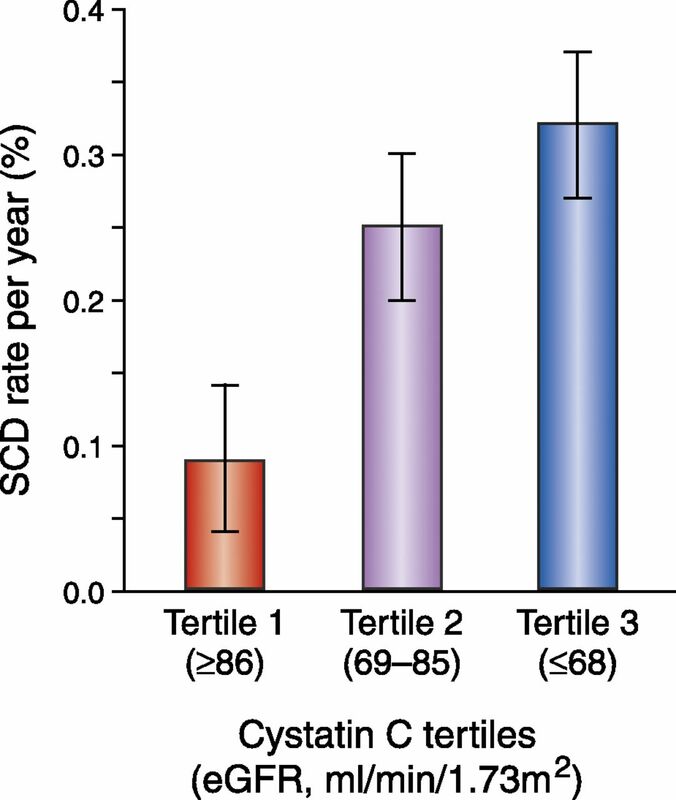 After multivariate adjustment, SCD risk is twice as likely in the preclinical kidney disease group compared with the normal kidney function referent group (creatinine-based eGFR ≥60 ml/min per 1.73 m2 and cystatin C <1.0 mg/L). These findings suggest that even mild reductions in kidney function increase risk of SCD, especially within susceptible populations such as the elderly. Finally, the strong association between ESRD and SCD extends to the pediatric population as well. In a retrospective analysis of nearly 1400 deaths among ESRD patients aged 0–30 years from the USRDS, cardiac arrests and arrhythmias comprised the majority of cardiac-related deaths, which occurred at a rate >2% per year.38 These findings suggest that mechanisms aside from atherosclerotic disease and CHF are responsible for triggering fatal arrhythmias in the ESRD population. The pathophysiology of SCD is complex and is believed to require the interaction between a transient event and underlying substrate. This process induces electrical instability and ventricular arrhythmias followed by hemodynamic collapse. An understanding of the mechanisms inciting these events may help clarify when the interaction between a triggering event and the underlying substrate proves harmful. Structural and electrophysiologic remodeling of the heart, vascular calcification and fibrosis, autonomic dysregulation, and volume and electrolyte shifts are some of the underlying processes thought to explain the increased predisposition for SCD in people with CKD (Figure 2). Finally, although some of the studies supporting the proposed mechanisms discussed below have been conducted in people with CKD who are not on renal replacement therapy, the majority of data come from the ESRD population. Overview of SCD and kidney dysfunction. Structural changes can alter the electrophysiologic properties of the myocardium. Fibrosis disrupts the normal myocardial architecture and results in a slowing of conduction velocity across the diseased tissue.63 This pathology can form heterogeneous zones of conduction and repolarization that can sustain a re-entrant arrhythmia such as ventricular tachycardia.51,53,64 These structural changes impair cardiac conduction, delay ventricular activation, and create late potentials in the terminal portion of the QRS complex. Furthermore, these low amplitude signals, which can be detected using a specialized signal-averaged electrocardiographic recording, have been identified in approximately 25% of dialysis patients.65 Several studies have also evaluated QT dispersion, which reflects nonhomogeneous recovery of ventricular excitability and is calculated as the difference between the longest and shortest QT interval in a standard 12-lead electrocardiogram. The QT dispersion is maximally elevated in the postdialysis period66–68 and reflects a greater susceptibility to arrhythmias. Ventricular arrhythmias and SCD in ESRD patients may be related to the timing of dialysis. An inability to maintain homeostasis predisposes these patients to adverse events especially after a long interdialytic interval. Cardiac arrhythmias and SCD are more common on Mondays and Tuesdays after hemodialysis-free weekends, and during the 12 hours after initiation of an hemodialysis session.73–76 These findings suggest that major shifts in BP, electrolytes, and volume may induce triggers that result in arrhythmias. Few clinical trials have been designed specifically to evaluate the efficacy of therapeutics and interventions for SCD prevention in the CKD population. The approach to reducing SCD risk in this group relies on data obtained from other high-risk populations and subgroup analyses of clinical trials. Pharmacologic agents used to treat comorbid conditions such as hypertension, diabetes, hyperlipidemia, and coronary disease are known to reduce the risk of severe cardiovascular complications including death. Because the pathways linking kidney disease to arrhythmic events and SCD are complex and likely involve high BP, dyslipidemia, and glucose intolerance, aggressive treatment of these common conditions may protect partially these patients from SCD. β-blockers are antiarrhythmic and anti-ischemic agents that not only reduce the risk of hospitalizations and death but also the risk of SCD.77–79 Randomized controlled trials providing this evidence have generally excluded individuals with CKD.80,81 In a recent meta-analysis that evaluated the efficacy of β-blockers in CKD patients with heart failure, there was a 34% relative reduction in cardiovascular mortality in treated patients compared with placebo.82 Although SCD was not a separate adjudicated outcome in these analyses, the effect on cardiovascular death likely was a result of an effect on both sudden and nonsudden cardiovascular events. Limited data also exist on the effect of β-blocker therapy in CKD patients without heart failure and in patients receiving dialysis. In dialysis the hypotensive side effects of β-blockers may be exacerbated by marked fluctuations in extracellular fluid volume. Adequately powered prospective randomized control trials assessing the effects of β-blockers in a broader population of individuals with advanced CKD are necessary. Statins lower cholesterol and have antioxidant properties that help attenuate endothelial dysfunction, prevent plaque rupture in vessel walls, and inhibit platelet aggregation and thrombus formation. Statin therapy associates with significant reductions in all-cause mortality in a series of clinical trials.83–85 These benefits were paralleled by a reduction in SCD incidence; however, limited data exist on the reduction of this specific outcome. This class of medications appears to be effective and safe for the secondary prevention of cardiovascular events in individuals with mild kidney disease. Retrospective analysis from the Cholesterol and Recurrent Events study, which was a randomized trial of pravastatin versus placebo in individuals with previous MI, identified 1711 participants (approximately 41% of the study population) with mild kidney disease.86 Pravastatin resulted in a 28% reduction in the primary endpoint of cardiovascular death or MI. Similar findings were documented in a meta-analysis that included 25,017 participants with CKD not requiring dialysis from 26 randomized controlled trials: statins decreased both the risk of all-cause mortality and cardiovascular events by nearly 20% each.87 Although SCD was not a separate, adjudicated outcome in these studies, their benefit in reducing cardiovascular mortality among higher risk participants with CHD is well established and likely reflects prevention of both sudden and nonsudden cardiac death. Several clinical trials have evaluated the role of statins in the dialysis population. Most recently, The Study of Heart and Renal Protection (SHARP) randomized 9270 patients with CKD to ezetimibe plus simvastatin or placebo. At the time of randomization, approximately one-third of the participants were receiving maintenance dialysis.88 After a median follow-up of 4.9 years, patients randomized to an ezetimibe/ simvastatin combination experienced a 17% reduction in major atherosclerotic events compared with the placebo group. Further subgroup analysis did not demonstrate a difference in the reduction of atherosclerotic events between study participants receiving chronic dialysis and those who were not. These findings suggest that statins and a subsequent lowering of the LDL may be beneficial in a wide range of patients with CKD including those on dialysis. These results differ from two other placebo-controlled statin trials in dialysis populations that did not demonstrate a reduction in cardiovascular death, MI and stroke,89,90 although secondary analyses from the AURORA study suggest some benefit from rosuvastatin treatment in dialysis patients with diabetes.91 This failure to achieve statistical significance in primary trials may have derived from the smaller number of participants enrolled in these trials. The SHARP study also noted that statin therapy was safe in patients with kidney disease. There was no excess elevation of hepatic transaminases, hepatitis, gallstones, or pancreatitis. Dysregulation of the renin-angiotensin-aldosterone system (RAAS) comprises a fundamental abnormality in cardiorenal disorders. Experimental evidence suggests that hyperaldosteronism may both result from and contribute to kidney injury.92 Animal models with kidney damage demonstrate a 10-fold increase in plasma aldosterone concentrations that precede the onset of hypertension, proteinuria, and glomerulosclerosis. More recently, epidemiologic studies demonstrate that elevated aldosterone concentrations are an independent risk factor for SCD in patients with coronary atherosclerosis and reduced eGFR.93 These findings provide additional justification for the use of RAAS inhibitors in patients with kidney disease. Medications that inhibit activation of RAAS are known to provide survival benefits in patients with CHF or MI.94 The benefits of angiotensin-converting enzyme inhibitors extend to patients with mild kidney dysfunction.95 In the Heart Outcomes and Prevention Evaluation study, treatment with ramipril reduced cardiovascular events, including cardiovascular mortality, to a similar extent as patients with normal kidney function. Mineralocorticoid receptor blockers such as spironolactone and eplerenone are also known to reduce SCD by 20%–30% in clinical trials enrolling patients with heart failure.96 These benefits extend to the subgroup with mild renal insufficiency; however, no trials have evaluated whether mineralocorticoid receptor blockers reduce SCD risk in patients with kidney disease alone and without heart failure. The American Heart Association’s recommendations for ICD implantation have evolved from identifying patients who have survived a cardiac arrest to high-risk populations for the primary prevention of SCD.24 For this later group, large clinical trials demonstrate that ICDs reduce mortality when implanted in those with clinical heart failure and a LVEF ≤35%.27,97 These clinical trials excluded participants with advanced kidney disease and ESRD; as a result, only registry-based and single-center data are available to inform ICD implantation in these patients. ICDs appear to reduce mortality risk in heart failure patients with CKD who are not on hemodialysis. A retrospective analysis from MADIT-II identified nearly 500 study participants (approximately 40% of the study population) with CKD. In participants with an eGFR ≥35 ml/min per 1.73 m2, the risks of all-cause mortality and SCD were significantly lower in the ICD group than in the conventional therapy group after 2 years of follow-up28 (Figure 3). No significant difference was found in either mortality or SCD risk between the two treatment groups for an eGFR <35 ml/min per 1.73 m2. The similar risk of SCD in the ICD and conventionally treated groups at an eGFR <35 ml/min per 1.73 m2 suggests reduced ICD responsiveness in this population with more advanced kidney disease. ICDs appear efficacious in dialysis patients who have survived an episode of sudden cardiac arrest.35,98 ESRD patients, identified from the Medicare database, who underwent ICD implantation within 30 days of the sudden cardiac arrest episode had a 42% reduction in death over a 5-year period than a matched sample of patients who did not undergo ICD implantation after experiencing cardiac arrest35 (Figure 4). Uncertainty, however, remains in defining the optimal use of ICD placement for primary prevention in these patients. ESRD patients have a high mortality risk even after ICD implantation,98,99 averaging 45 deaths per 100 patient-years of follow-up. According to a recent analysis from the USRDS that evaluated outcomes in nearly 10,000 dialysis patients undergoing ICD implantation over a 12-year period, the majority of cardiovascular deaths were arrhythmic.98 This group of ESRD patients was also more likely to receive appropriate therapies for ventricular fibrillation or ventricular tachycardia compared with their non-ESRD counterparts.100–102 This discordance between appropriate ICD shocks and increased arrhythmic mortality suggests that patients with severe kidney dysfunction may be intermittently refractory to ICD therapies because of the unique metabolic derangements imparted by renal failure and dialytic treatment.103,104 Defibrillation thresholds have also been reported to be higher in this group101 and may increase the risk of ICD nonresponsiveness. 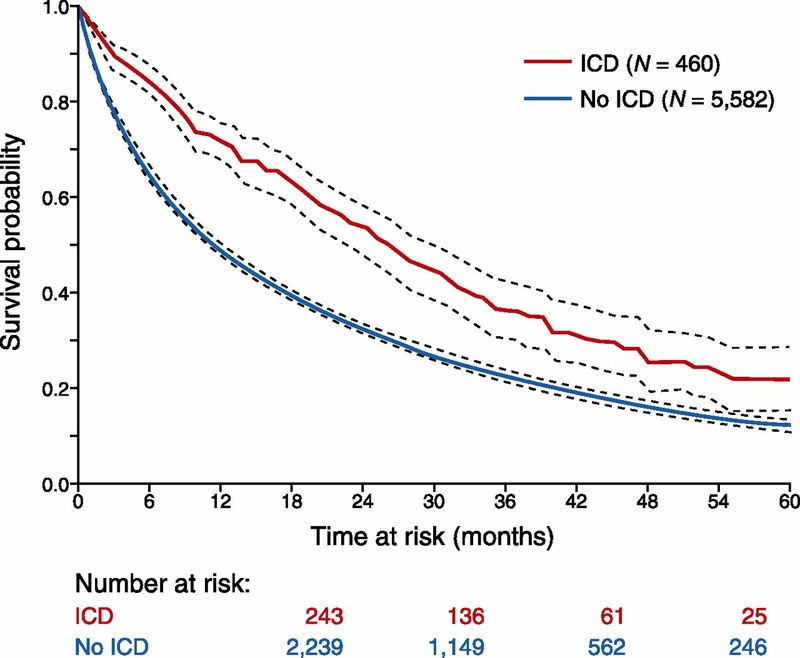 In addition, the high risk of all-cause mortality in ICD patients on dialysis may be explained by competing risks from other life-threatening disease process that the ICD would not be expected to effect. Finally, ESRD patients have a high risk of periprocedural complications; approximately 5% of devices became infected during each year of follow-up.98,105 This complication can result in sepsis that is refractory to antibiotic therapy, infective endocarditis, and often requires extraction of the entire ICD system. The elevated risk for both sudden and nonsudden deaths in ESRD patients and concerns for procedural-based complications related to ICD implantation emphasize the need for prospective clinical trials. The Implantable Cardioverter Defibrillators in Dialysis Patients trial has been approved in the Netherlands and aims to evaluate whether ICD therapy in dialysis patients aged 55–80 years will reduce the risk of SCD compared with patients with no ICDs.106 Until more definitive data are available, ICD implantation in dialysis patients requires a thorough review of the individual’s history for sudden cardiac arrest, presence of heart failure, left ventricular dysfunction, functional status, and a consideration of other medical comorbidities. This review has clarified that CKD patients are at an increased risk of sudden cardiac arrest, an outcome that is often fatal and carries a poor prognosis. Structural and electrophysiologic remodeling of the heart, vascular disease, and autonomic dysregulation are some of the underlying processes identified to explain the increased predisposition for SCD in people with CKD. Translational studies provide some insights into potential targets for identifying CKD patients who may be at higher risk for SCD events. Future studies will need to identify novel approaches toward arrhythmic risk stratification in CKD patients and evaluate whether treatment with medical and interventional therapies is effective and safe. R.D. is supported by National Institutes of Health Grant K23DK089118.